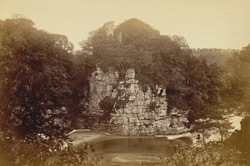 “The ruins of Corra Castle stands [sic] a few hundred feet from Corehouse. Its situation is very singular, and strongly marks the state of manners at the time it was erected. Nothing, however, is known of when or by whom it was built.